The above info came from yours truly. The image came from redconfetti. 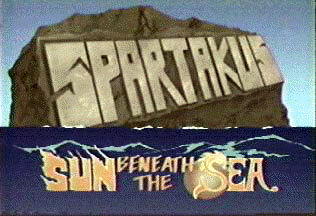 Spartakus and the Sun Beneath the Sea was actually French/Japanese cartoon by the name of "Les Mondes Engloutis". In the U.S., it aired in on Nickelodeon in the mid 1980's. The artwork can be described as Mobieus-ish, depending on how generous you want to be. It lasted for two full seasons, at 26 episodes per season. It involved two kids, Matt and Rebecca, and a flying machine by the name of "Tehrig". They had to find a way to re-ignite the artificial sun of the Arkadians that was created in the center of the Earth. The Arkadians are an offshoot of the human race that's been dwelling deep below ground for several thousand years. There are suggestions (but never anything solid) that they are the last remnants of Atlantis. When they first arrived there, they had technology far beyond current surface development. However, as they developed into a luxury lifestyle surrounded by their machines, they stopped learning as the machines took care of every aspect of their lives for them. By the time that their artificial sun began to fail, they had lost all knowledge of how their technology worked beyond "Press this button to get a banquet". Tehrig is a fully sentient vehicle-shaped robot which acted as the guardian of their library since they first arrived there. It's just about the only powerful piece of mobile technology left in their civilization. When the sun's failure became evident, some of the adolescents and children of their society sought out the library (which was by that stage just a legend). There they found Tehrig and vast stores of knowledge, but couldn't make use of most of it. Discovering from the library that there were entire nations on the surface, they used a mixture of their machines, some form of arcane magic, and some library knowledge to create the "avatar" of their people, Arkana, to journey to the surface world and bring back someone who could understand the technology necessary to repair or restart their sun. The assumption was that the whole world would have advanced further in technology rather than reverted and forgotten like the Arkadians had. Tehrig, as the only vehicle capable of the ascent, journeyed (with Arkana inside) towards the surface. Matt and Rebecca were, in a series of caves when Tehrig and Arkana arrived through the floor. Before any proper explanations or even introductions could be made, they were all attacked by the Pirates who may have been following Tehrig. The pirates were subterranean dwellers, possibly related to the Arkadians, though no explanation was ever offered. They were scavengers, living off stolen food and using stolen vehicles and machines, mostly Arkadian in origin, though heavily modified. Their main desire was to capture Tehrig as a new warship, though Tehrig was not armed. They also expressed an interest in ransoming Arkana and the others back to the Arkadians. To evade capture, Tehrig dived back underground with Matt and Rebecca on board and the pirates in close pursuit. The pirates were driven off by ambush of a lone nomad character, the Spartakus of the title, who joined Tehrig on the return journey to Arkadia. Matt tries to tell Tehrig and Arkana that he's not an engineer, but with the constant pirate attacks (averaging about two per episode), the pressing time limit, and general not-listening, he and Rebecca are brought back to the Arkadian library on the grounds that at least Matt knows enough to be able to learn more from the library contents. The above description came from Mark Finnegan and Sci Fi Guys, and was edited by yours truly (contact me).